Thousands of Kenyan children have been separated from their parents as they fled their homes following the recent elections according to Save the Childen. Some have seen their parents killed. Many others have been raped and beaten and are traumatised. Some in the very camps that are supposed to provide them with shelter and security. This is a problem that really needs to be addressed quickly. How? Perhaps the army can maintain law and order in the camps. This is not the ideal way to deal with a situation as complex as this but what are the options? The people and children in the camps are Kenya’s most vulnerable and they need protection. “We have spoken to many children who have been victims of violence and abuse and spoken to many more who have witnessed it,” said Save the Children emergency coordinator Matthew Wingate. Save the Children says that conditions in the displaced camps are worsening despite a lull in violence. “I left my home in Burnt Forest three days ago – we have travelled here (Nakuru showground) by getting lifts along the road. 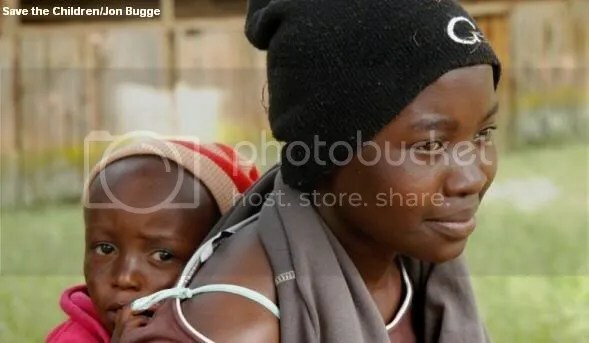 There is still violence in Burnt Forest and many people I know are still there,” said Jane Njeri, 28, as she comforted her crying 8 month old daughter. Jane has two other children with her in the camp; another 10 year old daughter, and a 4 year old son. Jane said “I do not want to return home. I would rather stay here – we have to start again – all I want is a house and some money so I can start to make a living again. I don’t know who burnt my house but I am worried for the people who remain in Burnt Forest.” Her young daughter starts to cry again and Jane turns to comfort her once more. The problem is that tragically there are children who are not able to say where they are from or who their parents are. A Red Cross Missing Persons helpline has been set up for people to contact should they have been separated from their relatives and children or know of anyone who is affected. Please consider dontating now to Save the Children and you could also give to Ladies in Action (how I love their moniker!) who are working on the ground to help feed and protect families and children who have lost everything they knew. The frustration of the internet for me is that while I sit here in London, relatively comfortable, I am unable to do more than blog about the situation. We are living in a connected world but only if you are economically affluent. The internet is a luxury especially if you are sitting in an IDP camp. Imagine that! Knowledge has boundaries. I take my hat off to all those who are working at ground level and have not taken their eye off what needs to be done. I welcome ideas on action that can be carried out from here from those who are actively engaged in helping people affected by the breakdown of Kenyan society.